Comprehensive desktop drawing package for Mac & Windows, which offers various diagramming solutions with advanced import and export capacities. Easy all-purpose diagramming tool on your desktop. Much easier than using Visio or Word for diagrams. 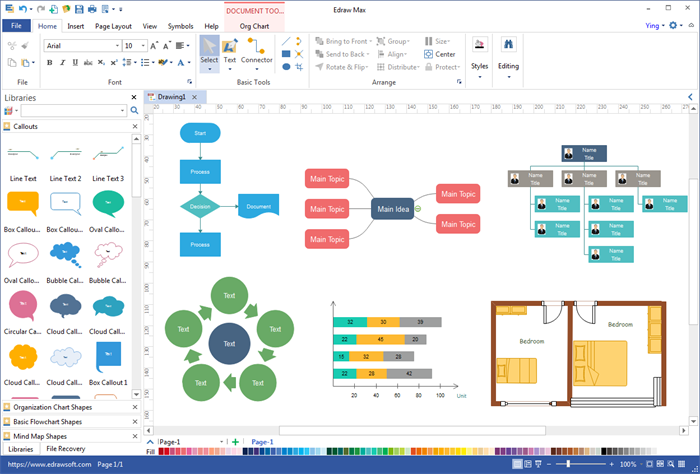 Edraw is an all-in-one desktop diagramming tool which can generate over 200 kinds of diagrams. It supports offline usage so users can save diagrams locally. An extensive collection of online resources are also easily accessible right from your desktop, including Q&As, tutorials and templates. Diagram anytime you like. Get online to sync for abundant, ever-expanding resources. Our program is an all-in-one diagram solution for Windows, Mac and Linux. With it, you can easily create diagrams, presentations, charts and graphs, cards, vector graphics, forms, fashion designs, floor plans, infographics, engineering graphic documents and more. It supports more than 260 drawing types. You can start with exact symbol package and tools for each drawing type. 1. Cross-platform desktop application that supports Windows, Mac OS X and Linux. 2. Access 260 drawing types, 12500+ symbols and thousands of templates and examples. 3. Offers cloud storage for effective document sharing and team collaboration. 4. Supports multiple export options including Visio, PDF, SVG, BMP, PS, Word, PPT, Excel, PNG, JPG, etc. 5. With the ability to import and edit Visio (.vdx, .vsdx) files. 6. Supports layers, hyperlinks, multiple pages, gridlines, automatic align and spacing. 7. Includes quick color palette, quick styles and themes to give your diagram an attractive look. 8. Be able to draw custom graphics and edit symbol libraries. 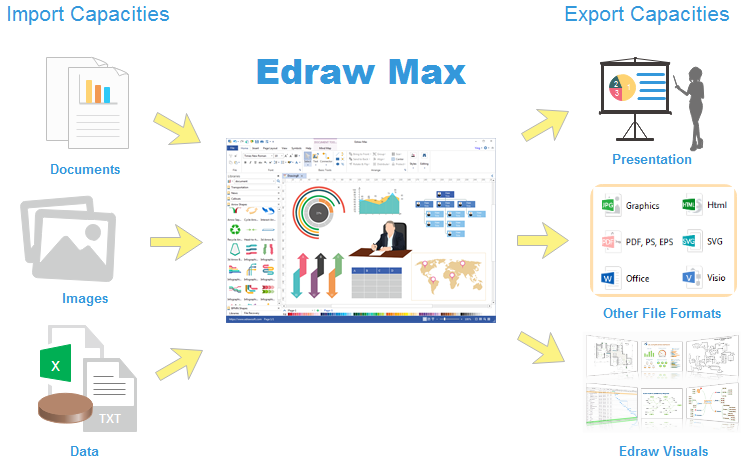 Edraw offers a variety of exports, making it easy to share files in the needed format. Creating output is simple: just one click allows you to export to other files, such as Microsoft PowerPoint, Word, and Visio. You can generate text and tables that are pertinent to your work. The export capability unlocks the information in your diagram to build documents. With one click, you can communicate status, update tasks, write articles, and build presentations from your graphic, choosing the appropriate document type and template. For example, you can generate a Gantt chart from a mind map with one click. Helpful copy and paste capability built into Edraw can be used to manage spreadsheet data from MS Excel. Data can easily be moved from one of the applications to another one by using copy and paste functionally, preserving data structure as data is transitioned into a different visual format. Edraw offers a set of tools to create presentations. With one click, you can generate a visually pleasing slideshow. 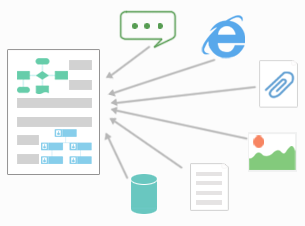 You can build multiple presentations and store them in a single diagram. 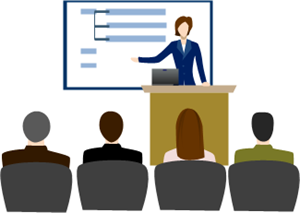 Different audiences require different types of presentations. You do not want to make a different map for each presentation. Edraw can create many types of presentations from a single diagram. Data comes in a variety of formats. You are able to input your data from many different file formats. 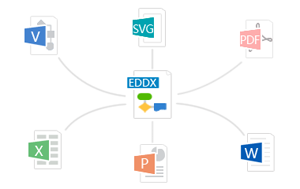 The flexible copy and paste capabilities of Edraw allow you to input data from Microsoft Word or Excel. You can import data from a Gantt chart, a Visio file or even input brainstorming or search results into the infographic you are creating. Edraw supports importing external data into the program with one click. Input capabilities are critical because it makes your data visual. For example, you can import excel data to create bar, column or pie chart and org chart. After the data is visualized, you can manage and communicate your data using newly generated documents or presentations. Edraw can be used as a versatile, yet easy-to-use tool for organizing ideas and data. Create infographics that intuitively illustrate your thought process. Outputs a wide variety of document styles and formats. Deliver presentations with built-in modes and MS PowerPoint export. Perfect for statistics analysis, project planning, brainstorming, meeting management, note taking, and more. We are continuously improving the software to make it more fast and efficient by embedding some automatic functions. 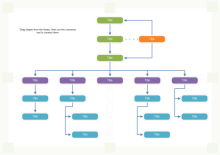 For example, when you draw a flowchart, you can use the floating buttons to add and connect a new shape with one click. It's really convenient and time saving. Lots of quality diagram examples are available both in the software and on the website. All the examples can be used as starting templates. It's easier to start with examples than to start from blank. 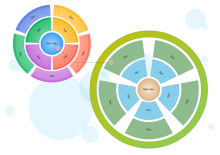 Circular chart templates that you can set ring number and segment number through floating buttons. Organizational chart that created by manually connecting shapes. SIPOC template that you can use to document a business process. 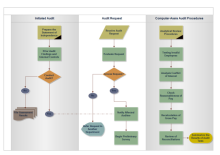 This is an audit flowchart template with swimlanes. You can download and use it directly. 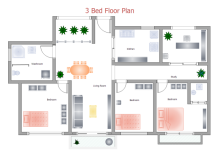 A home plan with 3 bedrooms and 1 bathroom. Click the thumbnail to download the original file. 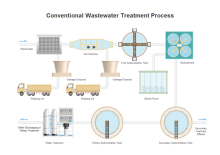 A piping and instrumentation diagram showing the process of waste water treatment. To sum up, Edraw is an advanced desktop diagramming tool with many automatic functions. With various diagrams it can generate, you can surely achieve impressive effect with infographics to stand out from the crowd.